In Victorian Great Britain, a new sickness spread among the wealthiest in society. Sufferers became obsessed with obtaining a fix, regardless of the danger or money involved. The name of this illness? Orchidelirium—a mania for collecting orchids. Orchid fever gripped England starting in the early 1800s after British naturalist William John Swainson used some orchids that hadn’t yet bloomed as packing material, thinking they were worthless weeds, while sending back some other exotic plants from Brazil. Upon arrival in Britain, some of the orchids burst into glorious flower, entrancing all those who saw them and sparking the growing obsession with the plant. Collectors were quickly dispatched by rich patrons and wily businessmen to sail across the oceans to the jungles of South America, the South Pacific, and elsewhere to search out the elusive plants. Such expeditions were hugely risky given the perils from wild animals, hostile natives, and tropical diseases, and many orchid hunters met a grisly end. For example, in 1901 an expedition of eight men entered the jungles of the Philippines in search of orchids: one was eaten by a tiger, a second was doused in oil and burnt to death, and five more were never seen again. The lone survivor of this dangerous mission emerged with an enormous haul of Phalaenopsis, also known as moth orchids, and probably made his fortune. The potential to make huge amounts of money meant that many ignored the danger of the jungles and joined the hunt for orchids. Many of these hunters were keen naturalists with a spirit of adventure who were employed by large orchid firms back in Europe to keep up their stock of fresh plants and hopefully discover new species. The list of collectors who perished in the search for orchids is long and full of gruesome anecdotes—William Arnold drowned in the Orinoco River, Gustavo Wallis died of yellow fever and malaria, David Bowman caught dysentery in the jungles of Columbia after returning there to restock when his first haul was stolen by rivals. Albert Millican, who in 1891 published the landmark text on orchid hunting Travels and Adventures of an Orchid Hunter, took part in five perilous trips to fetch orchids from the Andes. During his final expedition, he was stabbed to death. Safely back in Britain, it was the orchid dealers who became amazingly wealthy. Frederick Sander became known as “the orchid king,” and beginning in 1886 he was the official Royal Orchid Grower to Queen Victoria. He employed 23 orchid hunters, and owned a large orchid farm in St Albans, England with 60 greenhouses in which to store and cultivate the tropical plants. As his business boomed, he also opened farms in Summit, New Jersey and Bruges, Belgium. Sander trafficked in vast quantities of plants—at one point, he claimed to have imported over one million specimens of just one species from New Guinea. Sander and his fellow orchid dealers shipped millions of orchids back to Europe, but such was the delicate nature of the bulbs that frequently less than 1 percent of a ship’s cargo of orchids safely made it to market. One of Sander’s most valuable partners was Benedict Roezl, an orchid-hunter from Prague. Roezl was especially striking because he had only one hand, the other having been replaced with a metal hook after an accident while demonstrating some machinery he had invented. The piratical look only enhanced his reputation as an especially intrepid and ruthless orchid hunter. For 40 years, Roezl traveled across the Americas, either on horseback or by foot, discovering numerous new specimens (at least seven orchid varieties have since been named in his honor) and shipping vast quantities back to Sander to sell at great profit. Roezl was one of the few orchid hunters who made it to retirement, despite being robbed 17 times. His contribution to botany was so great that a statue of him was later erected in his home city of Prague. Sander was a tough boss, always pushing his orchid hunters to greater glories. He communicated with his team via cable and letter, and some of these fascinating pieces of correspondence now survive in the archives at Kew Gardens in London. One series of letters reveals that orchid hunter Wilhelm Micholitz, during a mission to New Guinea, was terrified by natives who practiced ritual sacrifice. Micholitz collected a shipload of orchids and was getting ready to sail home when disaster struck and his ship caught fire, resulting in the loss of his precious cargo. Micholitz wrote to Sander outlining the dangers and asking to be allowed to come home, only for Sander to cable the curt reply: “Return, recollect.” However, Sander did allow Micholitz to employ an armed guard, and the latter was delighted to later recount that he had found a new source of orchids in the jungle, albeit in rather gruesome circumstances—growing on a pile of human remains. Inevitably, given the great riches at stake—valuable plants could change hands for more than $1000 per plant, roughly equivalent to $24,390 in today’s money—the teams of orchid hunters developed fierce rivalries. Once a new species had been discovered, the collectors would strip the area to prevent their rivals from obtaining any of the new plants, devastating the environment in the process. On one occasion, orchid hunter William Arnold wrote to Sander to reveal he had been forced to pull a gun on his rival while collecting plants in Venezuela. Sander replied advising him to follow his enemy, collect what he collected, and then, when the opportunity arose, to urinate on the rival’s plants in the hopes of destroying his haul. 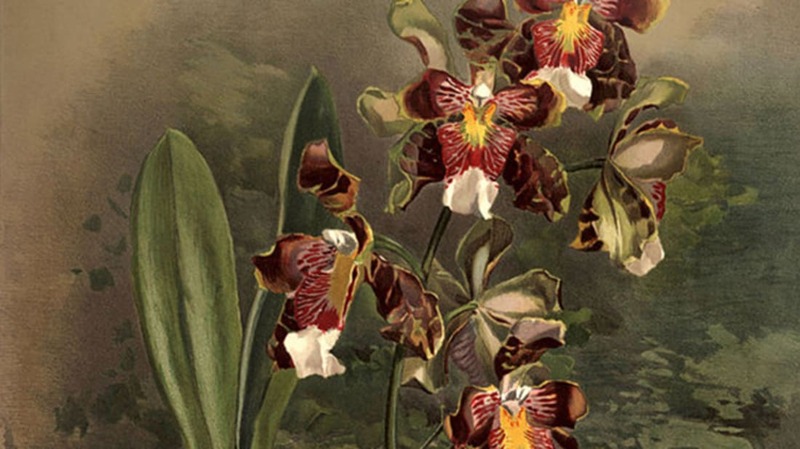 After nearly a hundred years of orchidelirium, the madness ended almost as suddenly as it had begun—increased botanical knowledge and the development of more sophisticated greenhouses meant that orchids no longer needed to be imported and could be cultivated in Europe. And of course, as soon as the plants became easily sourced, their value and cachet dropped. Today one can pick up an orchid for as little as $15—meaning that orchid hunters need not risk their lives for these amazing plants, and anyone can own a slice of the exotic.